Will winter wheat be injured or survive the recent low temperatures along with the lower temperatures experienced in late fall and early winter? Most of Nebraska has had little or no snow cover during this period. The greatest injury occurs when the soil is dry. Dry soil warms up and cools down six times faster than moist soil. Loose seedbeds at seeding also dry out faster and hence cool down and warm up more rapidly, contributing to winter injury. With the winds and lack of precipitation in many areas, the possibility of injury is increased. Winter wheat varieties vary in their tolerance to winter hardiness or injury. Many of the winter wheat varieties that do not have as much tolerance to cold temperatures were able to survive the recent winters with milder temperatures. 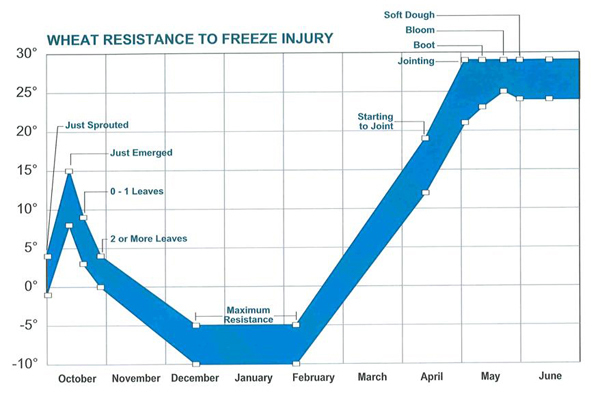 Other factors that are important when evaluating injury and survival of winter wheat include the temperature at the crown level and how well the crown is protected by soil. Winter wheat seeded shallowly will have the crown closer to the soil surface and be much more susceptible to winter injury. Exposed crowns on terraces or slopes have a greater chance of suffering winter injury. Winter wheat plants with a good crown root system and two or more tillers can tolerate the cold temperatures better than less developed plants. Also, plants that had time to cold harden properly as a result of temperatures that gradually declined are less susceptible to winter injury. The following method can be used in the winter after the soil thaws and prior to active wheat growth to determine if dormant wheat plants are alive and likely to resume active growth in the spring. Remove the top 3 inches of soil containing the plant crown (typically located 1 to 2 inches below the soil surface). Thaw the samples and warm to room temperature. Remove soil from the roots and wash with cool water to remove attached soil. Cut off roots below the crown and fall growth to within 1 inch above the crown. Rinse the crowns with cool water. Place 10 wet crowns in a labeled plastic bag, inflate the bag, and tie shut. Place the bags in a lighted room, but not in direct sunlight. Check the crowns in two days, rinse with cool water, and reinflate the bag. After four days, the crown should show about 2 inches of new growth. Plants that are not growing after six days should be considered dead when estimating survival. Some plants may grow poorly and develop molds that live on dead or injured plants. Remember, winterkill can be a very localized event, so select sample areas carefully and don't try to extrapolate results too widely. plant diseases are not a factor. Tables I and II provide an estimate of the potential of winter wheat yields based on healthy plants per foot of row in various row spacings. Table I. Estimated potential yield in bushels of winter wheat based on five tillers/plant, 22 seeds/head, and 16,000 seeds/pound. *To estimate yield in other Nebraska locations, multiply the table result by one of the following factors: southwest Nebraska, 0.9; central and south central Nebraska, 0.75; southeast Nebraska, 0.75. Yield potential should be adjusted for seeds per head and seed size. For information on seed sizes of winter wheat refer to the University of Nebraska–Lincoln ExtensionFall Seed Guide (EC103), which is updated and published annually. Winter wheat ranges from about 12,000 to 20,000 seeds per pound. For more information see the UNL Extension publication, Freeze Injury to Nebraska Wheat (EC132).